November Hobby Progress Challenge – Vindicators! 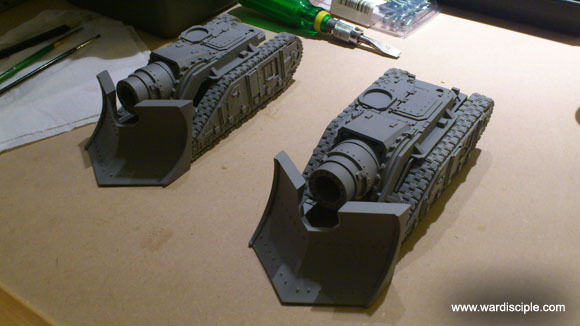 This month I will be assembling and painting the “Big Momma Cannons” I purchased from Puppetswar last spring. I am really just aiming to get one of these done, but if I can do both, so much the better. The only thing that really concerns me is the weather is taking a turn for the worse, as it always does this time of year. Priming could be a challenge. This entry was posted in 2013 Hobby Challenge, Chaos, Games Workshop, Hobby, Third Party Stuff, Warhammer 40000. Bookmark the permalink.